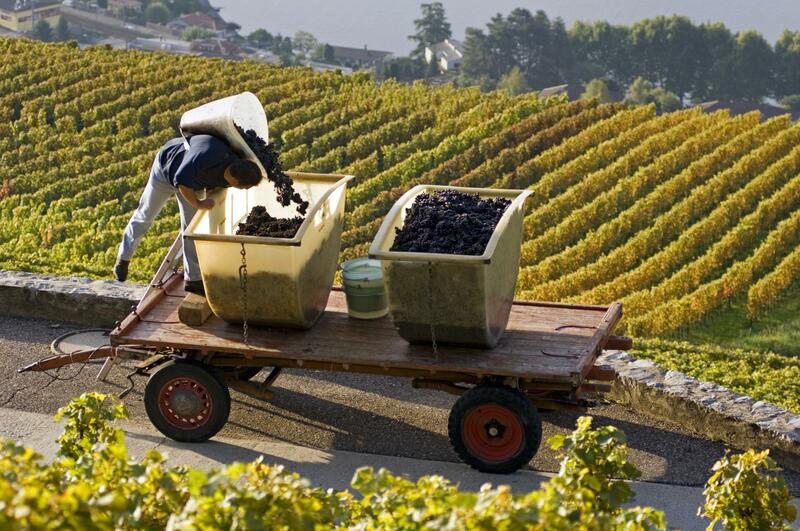 Covering more than 4,000 hectares of vineyard, the Lake Geneva Region is one of Switzerland’s major winegrowing regions. Structured into six regions and eight appellations of controlled origins, it attracts visitors with its vast choice of grape varieties and wines. 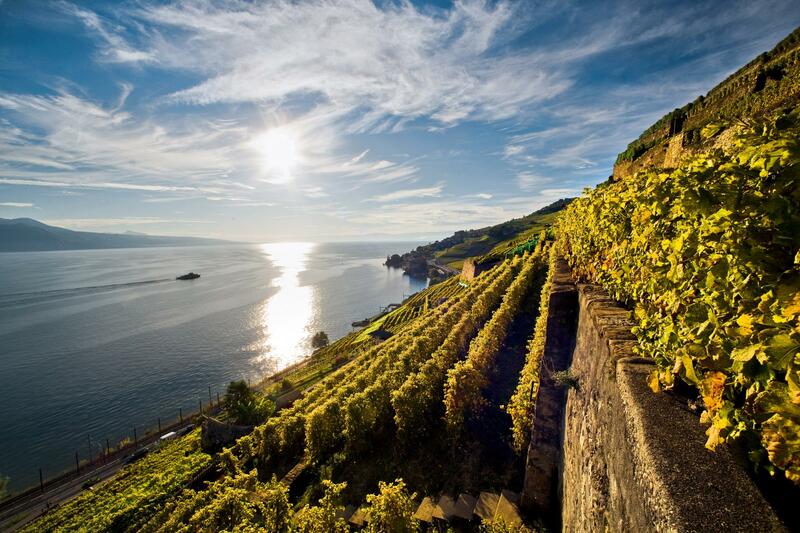 It is likely that the Romans introduced winegrowing to the shores of Lake Geneva and the Alps, a tradition that monks then developed throughout the Middle Ages. Vintner families took over during the Renaissance, and their descendants remain very attached to this tradition. The emblematic grape here is Chasselas, a tasty golden grape which yields crystal-clear whites that are appreciated as an aperitif and as an accompaniment for a cheese dish or fera fillet from the lake. The winegrowing canton of Vaud consists of six wine regions and eight AOCs: La Côte AOC, Lavaux (includes the three AOCs: Lavaux AOC, Calamin AOC and Dézaley AOC), Chablais AOC, Vully AOC, Bonvillars AOC and Les Côtes de l’Orbe AOC. 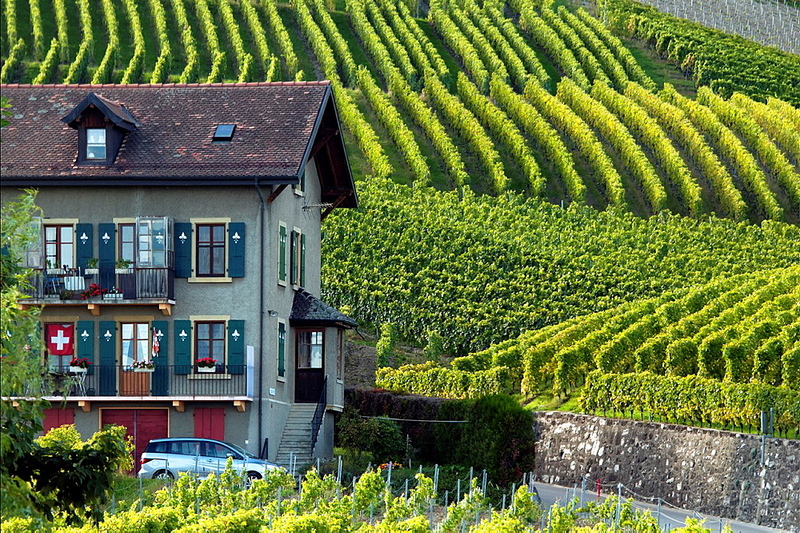 Rows of grape bushes around residential building, Fechy, a village in the midst of the vineyards, well-known for its high quality wine, district of Morges, canton Vaud, Romandy, the French-speaking part of Switzerland. There’s little doubt that the Canton of Vaud (the Lake Geneva Region) has made an art form of wine tourism. Just download the app Vaud:Guide and there are eight itineraries that offer walkers a chance to simultaneously enjoy spectacular scenery and visit one of the canton’s celebrated wine caves to taste and meet winegrowers and producers. The destinations include: Morges, Vully AOC, Lavaux UNESCO, Chablais AOC, Pays-d’Enhaut, Côtes de l’Orbe AOC (two loops), Vallée de Joux and Bonvillars AOC. Go to Vaud:Guide for details.